In the years since its foundation in 2003, the Eminence Symphony Orchestra has managed to become a household name in the world of orchestral game music. After a number of well-received recordings and recent collaborations with Blizzard, Namco and Hitoshi Sakimoto’s Basiscape on such high profile projects as SoulCalibur IV and Diablo III, the orchestra has become the go-to partner for game companies wishing to grace their products with a well-performed orchestral soundtrack. Needless to say, expectations for the orchestra’s 2009 edition of its highly regarded A Night in Fantasia concert series were running high. 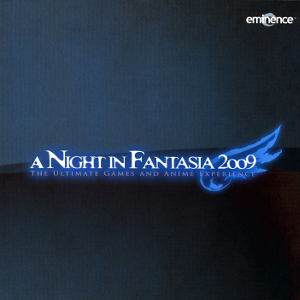 Contributing to the anticipation among game music enthusiasts was the fact that 2008 had not seen a Night in Fantasia concert, due to the orchestra’s busy recording schedule. Over the course of several months before the concerts, more and more details about the upcoming event were unveiled, whipping fans into a mild state of frenzy. The concert, taking place on September 26, would mostly feature original suites of popular game and anime music, instead of single, orchestrated or re-arranged tracks taken from a game or film’s soundtrack. While some arrangements were to be handled by such luminaries like Hayato Matsuo and Shiro Hamaguchi, the majority of suites would be created by Wataru Hokoyama, fresh off the success of his award-winning soundtrack for AFRIKA. In August 2009, a CD recording of the concert was announced — the first A Night in Fantasia recording since the 2004 Studio Ghibli Performance. An illustrious roster of guests, including composers Yasunori Mitsuda, Inon Zur and Kow Otani, as well as singers AIKA Tsuneoka and Aubrey Ashburn, was expected to attend the concert. All this was accompanied by a media campaign that included radio giveaways and TV coverage. Clearly, it was the Eminence Symphony Orchestra’s goal to stage one of the most ambitious orchestral game and anime concerts so far — certainly also motivated by the will to assure its elevated position as the foremost performer of such concerts in a market that has expanded significantly in the past few years and has seen productions like PLAY! A Video Game Symphony, Video Games Live, and Distant Worlds trying to secure their share of the pie. About four months after the event, the concert recording was released on a double CD, giving fans not a complete, but still comprehensive account of the event. Focusing solely on the music played on that evening, did the concert live up to the hype? Was it indeed the “biggest, boldest and best concert in the ‘A Night in Fantasia’ series to ever be held”, as the event had been heralded on the Eminence Symphony Orchestra’s website? The album’s first disc contains the majority of the concert’s game music arrangements, and things are certainly off to a great start with a suite from Wataru Hokoyama’s AFRIKA. While the game itself is rather obscure and so far has only been released in Japan, its soundtrack brought Hokoyama a first taste of industry success, earning him an award for Best Original Soundtrack at the Hollywood Music Awards and a nomination as Best Original Score for Video Game at the International Film Music Critics Association Awards. And after a listen to the A Night in Fantasia’s suite of his work, it easy to see why. Reminiscent of late 1980’s John Williams scores, the track opens with a sweeping statement from the whole orchestra, painting images of a wondrous, magical place far away with broad brush strokes. Hokoyama foregoes explicit sonic references to the game’s settings — while there is a short outburst of exotic percussion later in the piece, it is soon overwhelmed by the rest of the ensemble and becomes part of the orchestral texture, instead of taking centre place. While some may regard this a bit of a missed chance to add some variety to the concert’s sonic palette, Hokoyama’s talent for creating marvellously colourful orchestrations more than makes up for this. Every section of the orchestra gets time to shine, and apart from a slight intonation problem around 8:30 in the brass, the Eminence Symphony Orchestra acquits itself splendidly, fully mastering challenges such as the repeated fast runs in the trumpets and woodwinds that accentuate the action in the piece’s second half. Most of the time, the music is in very densely orchestrated full-on adventure mode here, but Hokoyama also provides a more quiet section dominated by playful woodwind after the grandiose opening to keep things interesting. Judging from the amazing sample of his compositional talent that is this opening suite, there is no doubt that Hokoyama is one of game music’s rising stars and that we can eagerly look forward to his future projects. Following up on such an impressive opening is a though act, but Hayato Matsuo’s arrangement of the “Radical Dreamers” theme manages to do just that. Given the attention that Chrono Cross has been given in past years in game music concerts, Matsuo faced the challenge of delivering a fresh take on a well known fan favourite and admirably succeeds in doing so. After a dreamy introduction for harps and horns over tremolo strings, the piece picks up the pace and eventually launches into a majestic statement of the Radical Dreamers theme on trombones. Matsuo successfully manages to “[blow] up the orchestration and thickness of it”, as he had stated as his prime objective in an interview beforehand, while keeping the delicate beauty of the theme’s original version intact. The theme is passed around the orchestra’s sections and becomes subject to a number of colourful variations, bathed in elegant counterpoint writing. Subsequently a steady drum beat and brass accents announce a more dramatic part of the suite, leading to the theme’s most triumphant iteration. A graceful coda for violins and harp closes another impressive Matsuo creation. Due to copyright reasons, only two arrangements of Western game soundtracks made it on the concert album, and unfortunately, they prove to be weak spots. Unfamiliar with Steve Jablonsky’s original soundtrack for Gears of War 2, I was hoping to discover a composition that’s closer to his work for Steamboy than the Media Venture-by-the-numbers work he churns out for Michael Bay projects like the Transformer franchise. Alas, no luck in this regard. The start of his Gears of War 2 suite, arranged by Hokoyama, is promising enough. An ominous atmosphere is quickly established by a clarinet ostinato, before the male choir, soon followed by the sopranos and altos, enters piano on top of suspended, chromatic chords in the violins, singing its foreboding “Ohhs” and “Ahhs”. However, this suspenseful mood is soon brushed aside in favour of what is now one of the most tired clichés in scorewriting for action movies: a constant emphasis on martial rhythms and ostinato figures played by the lower end of the orchestra (low strings and brass), with a suitably epic-sounding horn or trombone melody on top of the orchestral pounding. While there is still the occasional climax where the choir is allowed to sing a more expansive melody, especially the second half of the piece focuses way too much on unrelenting staccato rhythms that aren’t particularly interesting, neither harmonically nor rhythmically. Furthermore, a lack of counterpoint and not entirely predictably chord progressions renders the mentioned choral climaxes rather shallow and stale. It remains a mystery why this thematically barren arrangement ends up being the longest composition on the album — shaving off half of the piece’s 11 minutes would have helped a lot towards making it more bearable. Inon Zur’s arrangement of his own Prince of Persia soundtrack fares better, but not by that much. Using tried and true chord progressions and scales in its string melodies, his soundtrack makes a far greater — or more obvious, if you wish — effort to allude to its locale, or at least to tried-and-true Western representations of it, than Hokoyama’s AFRIKA. Ancient Arabia is further characterised in Zur’s composition by a section that marries those ‘typical’ Arabic string sounds with some ethnic percussion, which is however overshadowed by the already mentioned staples of contemporary action score writing: constant string ostinatos and brass accents. While the combination of driving orchestral rhythms and Arabic sounding violin melodies is effective to a degree, the abrupt and jarring change from the suite’s opening section to the new action material and the occasional lapse in rhythmic intonation among the orchestra’s brass players doesn’t help. Instead, the composition’s highlight is the following lyrical section for horns and oboes, which builds to a sweeping melody in the strings, featuring the best use of counterpoint in the suite so far. The piece finishes with a more bombastic reiteration of the rather generic opening melody, with strangely muted sounding cymbal crashes which would benefit from a clearer recording. In contrast to these two Western scores, the material from SoulCalibur and Ace Combat 5: The Unsung War demonstrates how soundtracks in the vein of “loud, epic and driven by insistent rhythms” can be pulled off more successfully. “Decisive Souls” had already been released as part of the SoulCalibur – The Resonance of Souls and Swords digital mini album, performed by none other than the Eminence Symphony Orchestra. Following a militaristic build-up based on a repetitive string crisis motif, “Decisive Souls” segues into a bombastic march section, fortunately with more character than similar passages in the monotonous Gears of War 2 suite, due to much more varied orchestral dynamics and and a more colourful orchestration. The following romantic development section features a enrapturing string melody and a beautiful countermelody for horns. Of all arrangements on the first CD, this one is most reminiscent of epic fantasy movie soundtrack stylings — certainly not a bad thing if these influences are handled as expertly as here, although the piece’s finishing percussion flourishes are a bit overbearing. “The Unsung War” from Ace Combat 5 features more militaristic material. Fitting its nature as a grandiose war anthem, the piece relies on constant drum beats and string ostinatos on the one and epic choral writing on the other hand. The piece opens with one such ostinato (played by the celli), over which the male choir enters with a solemn melody — a striking effect, although the tenors sound a little bit shaky on the first two or three notes. Somewhat similar in structure to Gears of War 2, changing between martial rhythms (here accompanied by the choir though) and grandiose choral outbursts, it remains more interesting throughout. The choral writing is more accomplished and the orchestral accompaniment manages to drive the piece forward and imbue it with energy without making it monotonous. The only — minor — problem with this piece is courtesy of its recording quality: occasionally, the choir is placed too backwardly and disappears behind the orchestra’s wall of sound, especially if the choir melody is doubled by the violins. Ending the first disc on a high note is Kow Otani’s arrangement of his own music from Shadow of the Colossus. After the relatively constant onslaught of romantic-style orchestral grandeur, the suite’s ominous opening is a welcome change of atmosphere, with descending chromatic figures in the violins over tremolo low strings. Singer AIKA Tsuneoka soon makes a presence known, and her commanding performance is one of the concert’s highlights; her powerful alto voices greatly raises the drama, especially in the composition’s hair-raising middle section and finish, which pits her against the full orchestra (including percussion) and choir. The recording engineers mostly find the right sonic balance between solo singer, orchestra and choir, although AIKA’s voice occasionally takes on a strangely cavernous sound, for example at the beginning of the piece and later around 4:30. Despite these minor technical snags, listening to Otani’s suite is an absolute pleasure; his control of orchestral dynamics is unparalleled on this album, with each section absolutely seamlessly flowing into the next, despite the piece as a whole going through a great number of changes in mood, orchestration and volume. Particularly beautiful is an elegiac passage for solo flute, quietly tolling bells and solemn choir at the end of the composition’s second third. Throughout the first disc, the Eminence Symphony Orchestra — through the choice of pieces it performs — makes true on Hiroaki Yura’s promise made in an earlier interview that the keyword of the concert will be “epic”, while providing enough diversity to keep the listening experience immersive. Although the second disc, filled with the concert’s anime arrangements, is more consistent in its focus on romantic-style, large-scale orchestra writing — no faux-Arabic overtones, no Hans Zimmer-inspired marches, no 20th century modernisms à la Otani — it makes up for this through more variation within the orchestral palette used. Prime example for this is the suite from Hayao Miyazaki’s My Neighbour Totoro, somewhat predictably the most light-hearted track on the whole album. Opening with busy strings, the ensuing scherzo — the concert’s first and only one — is an absolute delight, full of whimsical string melodies, playful woodwinds and pizzicato accents and a bouncy main theme. However, the track’s frenzy is interrupted by what turns out to be one of the concert’s emotional highlights — two tender solos for flute and then bassoon against a background of soft strings, fitfully evoking images of home and family and the warm feeling of security that comes along with these. Soon enough though, the piece breaks out into a carnival-esque march, now joined by a piano, at times hammering out chords to support the composition’s forward momentum, at times joyfully tinkling while the orchestra takes a short break. Throughout all this, the Eminence Symphony Orchestra’s playing is accomplished and masters all the difficulties Joe Hisaishi’s score — arranged by Hokoyama — throws at them. Still, the track’s last two minutes would have benefited from orchestral playing that’s a touch lighter than what we get in the end, preventing the composition from truly taking flight at its conclusion. The Eminence Symphony Orchestra’s decision to perform suites especially pays off — in theory at least — in the case of the Studio Ghibli material, simply because the orchestra has already performed single tracks from the studio’s musical output several times. However, this observation is only valid if the suite in question manages to compile the already existing musical material in one fluid composition, instead of just isolating snippets from the original work and then stringing them together incoherently. Somewhat oddly enough, this is clearly demonstrated by the other two suites based on Miyazaki’s movies and the different approach in regards to their arrangement is made all the more glaring because they succeed each other on the album. The suite from Laputa shows how it’s done properly. Opening with light piano and a nostalgic passage for violins before the uplifting main theme kicks in, the whole suite feels like one piece, gracefully flowing from one theme to the next, perfectly capturing the joyful sense of adventure and the feeling of roaming the world — and the skies above — with your friends by your side. One particular highlight is a march-like section towards the end of the track which is accompanied by woodwind arpeggios and which then transforms into a heroic brass outburst. However, ultimately the whole suite is source of constant delight, with its rich yet varied orchestral sound. Just one minor detail: why do the bass tubas around 2:25 and 2:45 sound like deep, unrefined buzzing that takes a much too prominent place in the recording of the orchestral texture? Unfortunately, Princess Mononoke takes the opposite approach to arranging. What we hear is a number of different themes from the movie’s soundtrack, with hardly any transitions between them — one theme ends, cue silence for 1-2 seconds, the next theme starts. Apart from the suite opening with thunderous drums (taken from the music cue accompanying the disastrous battle between the villagers and the boars in the movie), there are no surprises here. The themes are performed almost exactly the way they are on the film’s soundtrack recording: the main theme doesn’t develop quite as dynamically as the soundtrack version, the percussion in the middle section portraying the group of ghostly white forest creatures a slightly richer in the Eminence Symphony Orchestra’s performance, but that’s about. It’s all performed and recorded with great skill — the aforementioned battle cue sounds amazingly vivid, and the violins handle the waves of rising and falling, dissonant crisis motifs flawlessly — but considering the marvellous work that arranger Wataru Hokoyama has done elsewhere on this recording, the lack of inspiration on display here is puzzling. This leaves us with another arrangement that doesn’t justify its massive running time of over 10 minutes. “A Song of Fire and Storm” from Tsubasa Chronicles — as is to be expected from a piece carrying this name — shifts into a more dramatic gear by adding the choir to the arrangement again while the second CD nears its end. Once again, the choir proves to be the (comparatively) weak spot of the ensemble, with wobbly pitch and slightly off-beat timing during its entrances at 0:20 and 0:50. Otherwise, after about 90 minutes of stylistically quite coherent, mostly spectacular orchestral music, there’s not too much that lets this track stand out — the orchestration is rich, the choral climaxes are suitably grand, and it’s all quite stirring. What this arrangement brings to the table is the addition of hi-hats to the instrumental palette, which gives the track a welcome touch of orchestral pop. How do you end a concert in the most grandiose fashion possible when everybody and their grand-parents have heard “One-Winged Angel” a gazillion times by now, and you don’t want to try and impress them with yet another performance of this well-worn warhorse? Easy, write another piece for choir and big orchestra that sounds like it’s been heavily inspired by Carl Orff’s “O Fortuna”! To make things even a bit more dramatic, set the whole thing to the words of the “Dies Irae”, and there we go: another crowd-pleaser. And certainly, the Death Note suite, arranged by Kazuhiko Sawaguchi, is rather predictable in its structure and musical expression, at least initially. The choir sings a slow melody over an insistently driving rhythm in the low strings to build up tension, then all hell breaks loose, with a fortissimo orchestra backing an equally loud choir singing a more expansive, sweeping melody, then the whole thing starts over again. Sawaguchi keeps the proceedings interesting however by adding some nice touches to his orchestration: a flute figure during the second choral climax offers some much-needed counterpoint while the violins double the choir melody, and the second build-up section adds a xylophone and rapidly ascending and descending flute runs to the orchestral texture. However, while the end result is undeniably engrossing and would work terrifically as a concert closer, the choir and the way it’s recorded really become a problem here. The choir members are not in perfect sync during the build-up section (listen for those “s”‘s and “x”‘s at the end of words), but remain rhythmically secure enough to drive the piece forward. But during the second choral climax, the choir is either placed too backwardly in the recording or just sings much too quiet. In any case, the singers almost disappear behind the orchestra just after 2:00 and simply aren’t powerful enough to let the composition stir up all the drama that it could. Worse still, just when the listener thinks the arrangement — and thus the concert — will end with the requisite loud bang from the whole orchestra and choir, Sawaguchi throws us a curveball: the insistent string ostinato slows down, fades out, and the choir (first bass and tenor, then alto and soprano) enters, first a capella, then over quiet dissonant chords in the violins. After all the rage and fury that preceded this section, it’s a moment of almost religious wonder and mystery, a perfect and innovative way to close the concert… if only the basses wouldn’t struggle so very audibly with their pitch during their entrance. It almost ruins the transition between the two sections and, being placed so close to the end of the concert, remains a sour note that sticks with the listener — certainly more so than the obligatory, somewhat perfunctory orchestral flourish that ultimately closes the suite. So, was it worth the wait and the frenzied anticipation? Mostly, yes: the album’s varied enough to keep the listener interested during its whole length, while being stylistically coherent enough to avoid jarring transitions. The work that has gone into the arrangement of the suites and single tracks is massive and the majority of them are skillfully composed, establishing a natural flow when moving from one theme to the next. Several of these arrangements are nothing less than spectacular: the suites and re-interpretations of music from AFRIKA, Chrono Cross, Shadow of the Colossus, Laputa, and The Melancholy of Haruhi Suzumiya are deeply impressive and up there with the best that orchestral game and anime music has to offer. Even lesser suites such as those from Astro Boy and Tsubasa Chronicles fail to greatly impress not because of an inherent lack of quality — they’re highly entertaining works in and of themselves — but rather because they’re surrounded by sterling arrangements of other works which simply outshine them. Apart from the occasional, slight slip in intonation or rhythmic accuracy, the orchestra’s playing is polished and remains impressive throughout the album. Unfortunately, it’s difficult to overlook the recording’s two major flaws. Far too often, the choir falls behind the rest of the ensemble in terms of technical proficiency (and isn’t always served well by the album’s recording quality). It’s hardly a game breaker most of the time, but still, the choir’s insecurities in intonation have the potential to impact the impression the music makes on the listener, most notably in the case of the Death Note suite. A comparison with the technically more accomplished Symphonic Fantasies concert series may be somewhat unfair — given that the WDR Radio Orchestra and Choir are state-funded institutions with an illustrious performance history reaching back several decades — but what ultimately counts is the end result that the interested fan pays for when she buys the recording. Furthermore, not all of the suites meet the standards of the majority of the concert’s arrangements: the Gears of War 2 suite is mostly bland, and the collection of themes from Princess Mononoke — it’s really just that — is downright uninspired. The fact that both suites are more than 10 minutes long hurts the flow of the album considerably. But despite these weaknesses, A Night in Fantasia 2009 is easily worth purchasing just for the highlights mentioned above and ultimately offers about 80 minutes of good to seriously amazing music. This is for a more than reasonable price — currently, the two disc set is priced at just $19.95 on the Eminence Symphony Orchestra’s website. It’s certainly a must-buy for fans of orchestral game and anime music and a confirmation of the Eminence Symphony Orchestra position in the market, but not quite the revelation it aims to be. Posted on August 1, 2012 by Simon Elchlepp. Last modified on January 18, 2016.